The first New Moon of 2019 happens on Monday 4 February, in Aquarius! This is essentially a second New Year for astrology. This is no ordinary dark moon. It’s the first one after January’s eclipses and the first in its sign after last July’s angry total lunar eclipse in Aquarius! This is a a wonderful opportunity to raise our vibration and renew our commitment to our dreams and ideals! It’s time for renewal and a fresh start. And what a start! What does the Aquarius New Moon mean? What your life needs most right now is your own personal touch of genius! Be true to yourself and, in time, you’ll find people that you can be yourself around. In this way, what was dead only a minute ago suddenly springs to life. This New Moon is a second opportunity to effect positive change. We can do better this time! The Moon becoming new in Aquarius also conjures up images of making progress at the knick of time! A chance to make things right! Aquarius wants to make a difference in the world. Where do we want to be in years to come? What are our dreams and ideals? Who are our people? This is our chance to make it happen. For instance, if you have been playing around with a relationship, testing the waters, it’s time to decide if you really want to take things forward. Or, say you have been planning a trip and imagining all the wonderful places you want to go. Now is the time to decide if you will go for it or if it was just a pipe-dream. There’s still time in which to make progress and make things right. Breathe New Life into your Hopes and Dreams! This New Moon will shed light on a widening gap between our dreams and reality, bringing important dilemmas to the forefront that are likely to trouble us for the foreseeable future. With the Moon still in independent Aquarius however, we truly have a golden chance to make progress and be proactive right now, while there's still time; while our vision is clear. What a wonderful gift from the Universe! We are getting a magical chance to reconnect with a long held wish or dream. 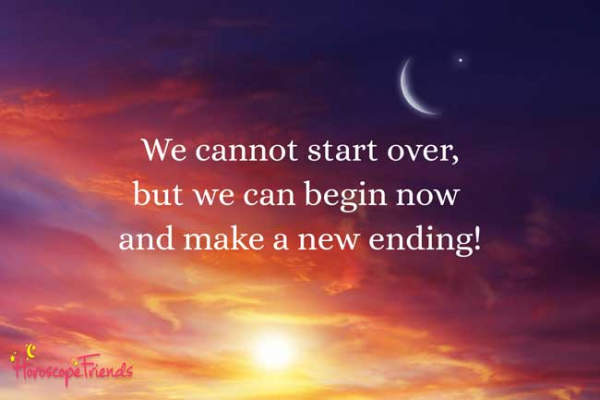 It is also the perfect time to inject new life into a cherished project or relationship or start something that you have been thinking about for a while but have been unable to get on with due to every-day life getting in the way. Do proceed carefully to avoid mistakes - best begin the week by observing closely and reconnecting with things and people you already know. This is a unique opportunity to come together and make important decisions and to bring our reality more into line with our vision. It’s a chance to examine our lives and think about what we want to manifest on this earth. What world do you want to live in? Use this new moon to make your vision a reality! The Universe wants us to give new and progressive ideas a real fighting chance! Check this out now: Your daily natal horoscope, including all the planetary aspects that affect you personally! The February Aquarius New Moon brings a fresh start for all zodiac signs. It’s a second chance to decide on our future course! Feeling unhappy? Look for innovative solutions and think outside the box, says astrology! Read your special New Moon horoscope! You can now rally your forces around a long-held dream, re-commit to your goals or re-kindle a friendship. If you have been meaning to set up a group, gather a team of people you already trust to achieve something that has been on your mind for a while, or arrange any kind of reunion, now is the perfect time! You can count on your friends. This New Moon is a final opportunity to pursue your dreams and increase your influence. It does come with some strings attached though - possibly to a university, publishing house or foreign land. Best leave sleeping dragons lie. A tip for you: Be yourself! Uncensored! This New Moon shines a powerful spotlight on your career! You may be called to re-occupy, defend or re-affirm an old title. It's time to review your life direction, revisit old goals and renew your efforts towards those goals that you still want to achieve, but life has been too hectic to allow you to return to them. This is the perfect opportunity to re-launch your career and re-brand your public image! Events have conspired to bring you into the spotlight and increase your influence over the past few months. This New Moon is the final act in the show, a last chance to establish your authority and consolidate your image. It may be time to repay debts to friends or invest in your dreams, even if you know it won't be perfect. A tip for you: Embrace your quirky uniqueness! And use your intuition. The Universe is intent on expanding your horizons! This new moon brings round two of inspiring people and ideas that renew your faith and raise your sights to greener and brighter pastures. Have you been thinking of travel or embarking on a new course? Now is the time to make it happen. If your career and relationships are weighing you down or starting to pull in different directions, a more philosophical stance will help. This is your cue to focus on the things that you believe in and re-envision your future! If you have been meaning to plan a big journey or embark on further education, now is your moment to infuse these plans with new life and start looking into the best options for you. It is also a good time to seek help from VIPs who can help you expand your base of operations. A tip for you: Don’t get hung up on one person. This New Moon will breathe new life into your finances - especially anything to do with grants, bonuses, loans and shared investments. It may bring a business collaboration with someone from your past, an opportunity to re-launch a business deal or re-invent the way you handle money. It will re-invigorate your financial dealings and intimate relationships, so you can proceed more empowered into the future. Taxes, investments, commissions, loans...it's been all systems go on that front for a while now and you've made significant advances. This trend continues, giving you a chance to set your business dealings straight. It's also a chance to get closer to someone special and build trust. Your working situation is difficult and you may be dreaming of escape abroad or into brighter days. It will never be just perfect, so invest where it matters. A tip for you: You’re different. Embracing your unconventional image! There is a bright new spark in your relationship zone and it's time to focus all your energies on your significant other. If you are still looking for him or her, this is an excellent opportunity for you to consider carefully what kind of person you want to be with. If old ties are renewed, then this is your chance to be honest and do things right. This New Moon is your chance to evaluate where a relationship is headed, see wherey you are prepared to compromise a little and - above all - if you can build the trust necessary to move forward. Feeling trapped in a loveless relationship? Or maybe there’s lots of love and passion but something stands in the way of its expression? Don’t get trapped in a problem mentality. Break out! Take an invigorating holiday together, move half-way across the world or change your philosophy! Business partnerships will also receive a boost by this New Moon. A tip for you: It’s time for a clear-headed fresh start. This New Moon is your cue to pay attention to how you run your day to day life. If you have been letting things slide ever since the holidays, it's time to get back to a healthy and productive eating and exercise programme! Your work and colleagues will also be a major area of focus, giving you a chance to go over everything with a fine comb and straighten things out. This New Moon is a second chance to get everything in working order - something a dear Virgo loves. If you find it hard to reconcile your partner's and your family's needs and this is taking its toll, then it may be time to put your own wellbeing first - it's the only way to help anyone at all. A tip for you: Cut intrusive ties and assert your independence! This New Moon is your chance to focus on all the things that bring you joy and happiness, have fun with your kids or return to a favourite hobby. It is also a great window of opportunity to find love or reconnect with an old lover. This is your cue to have fun and express yourself. If you are creatively inclined, this is the perfect time to focus your attention on a creative project and give it a new lease of life! Love, creativity and children continue to hold top spot on the agenda, giving you many joyful moments. This prolonged focus can help you sort out your love-life, renew your efforts if you're trying to conceive or successfully complete a creative project. This might require sacrifices in your day-to-day life, but it will be worth it in the end! A tip for you: Let someone surprise you! The spotlight remains firmly on your home-base. This New Moon offers a second boost of energy to help you finalise improvements with home, family or real-estate matters. A parent may take up a lot of your time and it is good that you give it, to make sure everything at home is as it should be. Real-estate projects that have stalled can also receive a new boost of energy now, so make sure to make the best of it for the next couple of weeks. You may be carrying a heavy financial burden, but it is a worthy sacrifice in the name of love, children or a creative project. Focus once more on building a secure foundation. A tip for you: Think outside the box and come up with creative solutions! Get ready for the world around you to burst into life with lots of people and ideas invigorating your mind! If you have been meaning to reconnect with people, find out more about a course or start looking for a new car, this is your cue to start your research or get in touch. If you want to try your hand at writing, this is a great window of opportunity for that too! This is your cue to network and feed your mind! Travel is still on the cards. If you have been putting off a journey or important communication now is the time to reconsider. You have a second chance to establish positive contact: family commitments may make you feel like a martyr, but taking responsibility now can prevent more insidious difficulties later. A tip for you: Let your creativity speak for itself! Express your love! It’s time for a financial fresh start, but more importantly, to review your priorities and rethink how you invest your energies work and relationship-wise. It's all about money for you, dear Capricorn, as this New Moon shines a spotlight on your finances. This is a second chance to increase your income and take care of any bills or expenses Is there anything you can do to manage your resources more cleverly? Is there a source of income you hadn't thought of? A way to cut needless expenditure? If you have been meaning to put certain abilities into good use but have not had the chance yet, this New Moon may bring you the opportunity you seek. It's also a good chance to address health matters ahead of time, get the facts straight and take care of your body. Things may not be perfect but you should be able to find the resources to sort them out. A tip for you: Release the past! Time to discover your inner rebel. This New Moon signals your annual cue to re-invent yourself, promote yourself and focus on taking care of number one. Being such a socially aware sign with such a grand vision, there is no doubt that if you take care of yourself others will benefit too, so no need to be shy about it. This is also a perfect opportunity for a make-over, a new wardrobe or a face-lift of your internet presence - anything that will revamp your appearance and re-invigorate your aims! This is round two of you going after what you want and steering your life in the desired direction. Some small sacrifice now can forestall potential financial difficulties with friends and allies in future. The situation is not perfect but you are the best person right now to lead the way. A tip for you: Have a candid discussion! Speak your truth! The Aquarian New Moon is your cue to try and blend in, so you can focus on your inner life and reconnect with your guiding spirits. If you are involved with large institutions, this New Moon might signal a new beginning amidst restructures there, redefining your relationship to the collective. After some period of uncertainty, you have another chance at consolidating your position within a large institution and making quiet progress. Increased responsibilities at work or with a parent may require some sacrifice on your part, but it's all for the greater good. Use your intuition. This is also a chance to recuperate and gather your strength. A tip for you: Review your priorities!